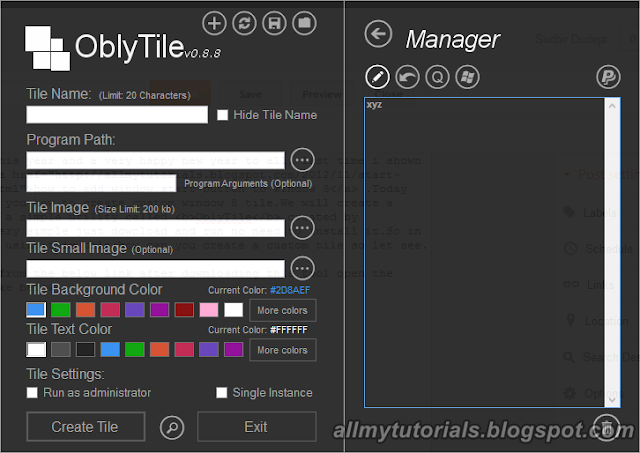 This is my first post in this year and a very happy new year to all, last time i shown you different methods of how to add window start button to window 8 .Today in my tutorial i will show you how to create window 8 tile.We will create a window 8 tile using a simple utility called OblyTile created by Argony-OT this is very simple just download and run no need to install it.So in today tutorial i will show using this tile how can you create a custom tile so let see. Download this simple tool from the below link after downloading this tool open the tool. Your tool will look like exactly like below image. 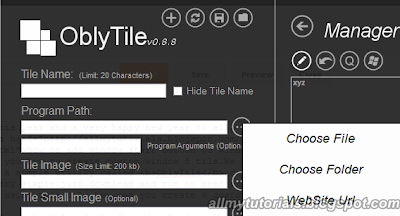 So after opening it you have to enter the name of your tile , after that you have to choose whether you want to create a custom tile for Folder ,program or a URL so i choose to create a tile for a website so when i clicked on my tile my website should open.so see below image. after that i will enter the URL of my website in the Program Path Location and leave program argument location blank , and than i choose the image of my custom tile ,and after that i choose the path of small image , it a optional but if you want you can upload because the small image that you choose for your tile will appear on tile while searching your custom tile(See below image). 2. )Added Quick List of some windows installed programs with there images. 3. )Convert installed programs shortcuts to tiles directly. 4. )And To convert Window tiles to shortcuts. You can also delete your custom tiles whenever you want using this utility.I hope you like post if you like this utility you can also donate to developer.Don’t forget to subscribe to my blog and keep sharing . 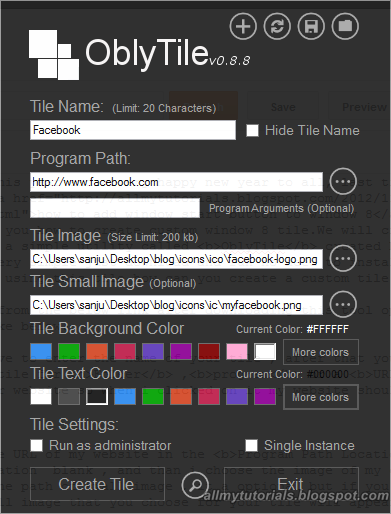 This utility is used only to create static tiles not lives tiles. How to get rid of questscan search or questscan virus.